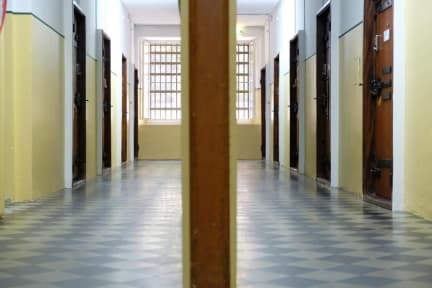 Welcome to Barabas Luzern, Switzerland’s first jailhouse hostel. You don’t have to book an expensive flight to San Francisco to take a look at an ancient prison. Just come to Lucerne! To begin with it’s much cheaper and second you’ll have the unique opportunity of staying overnight, plunging into the ancient times of bad boys. But with a restful sleep. Unlike earlier, our guests will find a completely renovated building with a lot of conveniences and most importantly: comfortable beds. We take care of your physical well-being, put away bread and water and replaced them with various delicacies. Well, that’s self-evident, isn’t it? Get locked up right now! The Barabas Luzern hostel is located in the old town of Lucerne, not even 10 minutes walking distance from Lucerne main station. You can reach all important sightseeing spots within a few steps: Chapel bridge, old town, city centre, lion monument, city wall, the Reuss river and the bay of lake Lucerne. Shops as well as bars and restaurants are located nearby. The Barabas provides 60 different prison cells. We have multibed rooms with a shared bathroom; but also single, double and family rooms with a private bathroom. The library, offering a large amount of crime novels, is also bookable as a bedroom. Payment upon arrival by cash (CHF or EUR), credit cards, debit cards (EC Maestro, V-Pay, Postcard). Reception is open from 07:00 - 23:00. Great breakfast and facilities. Very considerate and helpful for them to send the city pass to me in advance.